Their smell reminds Devon Granger of a bait truck. And when she runs them over with her car, the sound makes her think of popcorn, popping. Granger is talking about the caterpillars. That’s right. 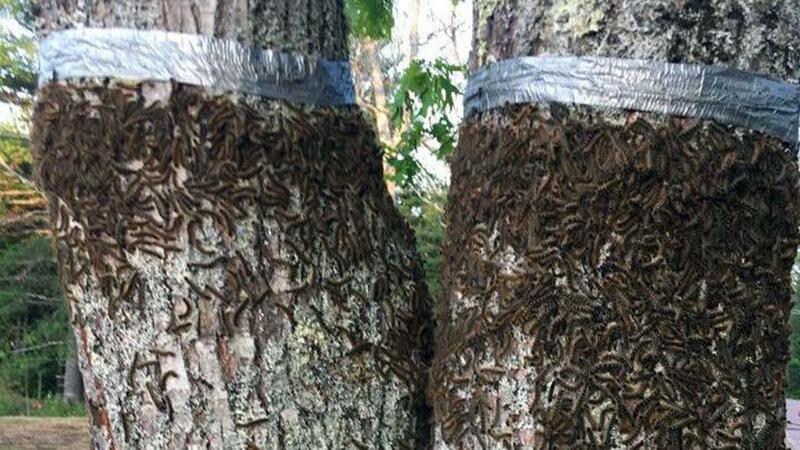 Millions of caterpillars have invaded Blue Hill, Maine for the last few weeks, eating everything on their path and even triggering a statewide traffic advisory for slippery conditions. Millions of the fuzzy little beasts have flooded Mines Road between Second and Third ponds for the last few weeks or so. It has created such a hazard that state officials have placed an electronic sign in the area and posted a statewide traffic advisory warning motorists to go slow in the slippery conditions lest they have an accident. The approximately 2-mile stretch of the road, which is also known as Route 176 or Route 15, features trees almost completely denuded of leaves, said Aaron Osborn, a 23-year-old plumber from Brooksville whose mother, Margaret Perkins Tufts, lives between the ponds on Douglas Loop road. “It looks like fall, out that way,” said Granger, a 37-year-old waitress and bartender at Marlintini’s Grill at 83 Mines Road, of the trees that have been eaten bare by the insects. 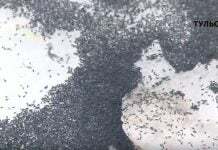 The above video shot by Margaret Tufts shows caterpillars swarming over an outside wall of her home, with her groaning in disgust. Her friends’ Facebook comments on her problem mix horror with wry fascination. “Maybe this is the storm before the calm??? That is just amazing,” said Lori Jablon. “I’m never going there again,” John Veazie said. “Def[inetly] need a flamethrower,” Elizabeth Rice said. Several friends recommended hiring an exterminator. One called the situation her worst nightmare. “Get out the leaf blower, blow them into a pile and pour some gas on them and then FLAME on. We’ll get some clear packing tape, blow them off the house and put the tape on the building,” Rick Blouin advised. 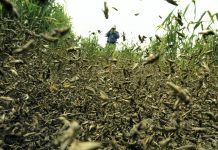 Tufts said it has been sad and disgusting to live under siege from caterpillars. “All of our oaks have no leaves in them. It has kind of driven us in our house and then out of our house just to get away from them,” she said. The caterpillars seem to come to the area every five to seven years. Nobody seems to know why they return to this stretch of road without flooding other, nearby areas as well, Granger said. People have speculated that the caterpillars find the humidity and water supply provided by the ponds a good source of regeneration. Some, Tufts said, have said that a dry spring is responsible for the infestation, but she doesn’t buy that. The Tufts haven’t hired an exterminator or sprayed bug killer themselves because they don’t want to harm anything else. Instead, they are following the advice of an arborist who told them to wrap duct tape around the bottom of tree trunks and to cover the tape with petroleum jelly, she said. That actually works. “They won’t go over the tape,” Tufts said. Tufts said she could see her family moving out of their home if the infestation becomes a more regular event. 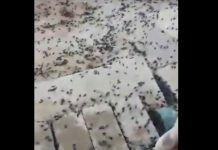 I don’t know what trigger these caterpillar invasions but it is kind of really disgusting! what do they turn into? Gypsy moth caterpillars. Disgusting creatures brought to the US by someone hoping to make silk from their cocoons. We have been living with this plague in PA since the 1970’s. They get so bad sometimes they cause cars to slide off roads.